Since listing on the ASX in early 2017, Kalamazoo has continually investigated the acquisition of mineral assets with inherent potential that can be exploited by advanced exploration and development technologies. Following this strategy Kalamazoo identified the highly prospective Bendigo Zone in Victoria as the focus for securing an extensive and promising tenement position. Kalamazoo’s Project Generation team identified an opportunity to secure the Castlemaine Gold Project at Castlemaine at minimal cost. Concurrently our due diligence and technical assessment has confirmed our belief in the project’s significant potential. Kalamazoo recognises that we have the opportunity to cost effectively add modern exploration techniques at the Castlemaine Gold Project. This will enhance our understanding of the structural controls of mineralisation that are critical to drill targeting and unlocking the true potential of this style of deposit. 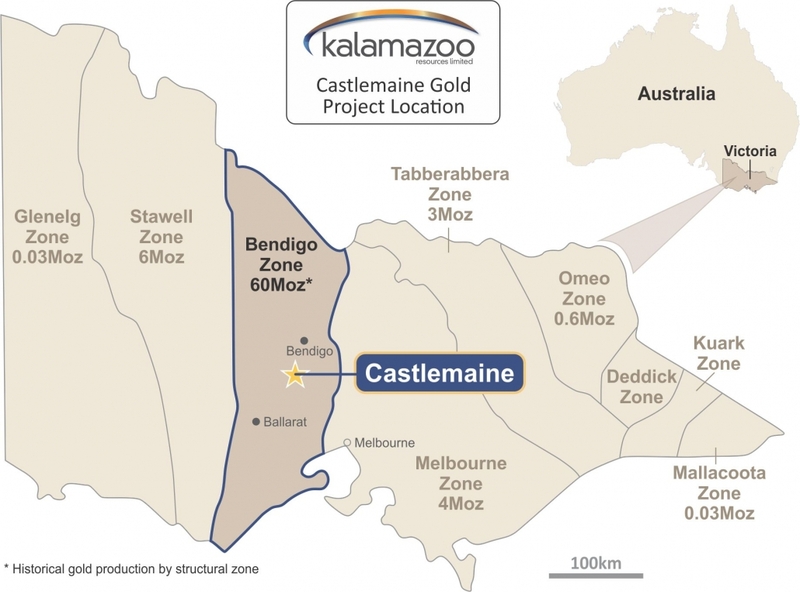 The Castlemaine Gold Project adds a significant gold project to Kalamazoo’s portfolio, at an extremely low cost. The asset is in a supportive mining region which is becoming increasingly active with significant exploration and development success across multiple projects including Fosterville, Tandarra and Costerfield (Figure 2). Strategically, the Castlemaine region is well supported with a number of gold processing plants within 80km haulage distance of the Castlemaine Gold Project. Kalamazoo was granted Exploration Licence EL006679 on 18th June 2018, covering the Castlemaine Gold Project, near the town of Castlemaine, in Victoria (Figures 1, 2 & 3). In addition, Kalamazoo has made a further exploration licence application EL006752, to the east and south of the granted tenement, covering regional geological structures known to be associated with gold potential. Exploration Licence 006679 lies immediately east and south of the town of Castlemaine and covers almost the entire historic Castlemaine Goldfield for an area of 70km2. The application for a second Exploration Licence 006752, covers an area of 218km2, thus taking the total tenement holding (once granted) to 288km2. The Bendigo Zone is the second highest producing goldfield in Australia having produced an estimated 60Moz from alluvial and continuous quartz reef mining activity from 1853 to 1954 (Willman et al 2002, Geology Survey Victoria, Report 121). From within this zone, the Bendigo Goldfield produced an estimated 22Moz primarily from quartz reef mining. The Ballarat Goldfield was the second largest with an estimated 10Moz produced (Figure 4). Castlemaine was the next richest goldfield in Victoria, having produced 5.6 million ounces since 1851 from both alluvial and underground sources (Figure 4). Previous mining and exploration at Castlemaine targeted shallower areas primarily within 400m of the surface. (Willman et al 2002, Geology Survey Victoria, Report 121). The recent exploration success that has been achieved by Kirkland Lake Gold (ASX: KLA) at the Fosterville Gold Mine demonstrates the substantial gold prospectivity that the Victorian systems can possess at depth (Fosterville Mineral Reserves increased approximately 247% from December 31, 2016 to 1.7Moz @ 23.1g/t – refer to ASX: KLA 3 May 2018). Successful exploration north of Wattle Gully along the Whitelaw Fault Corridor by companies such Catalyst Metals (ASX: CYL), Navarre Minerals Limited (ASX: NML), Hancock Prospecting Pty Ltd and others has also resulted in a number of significant new gold discoveries such as Sebastian North, Tandarra, Four Eagles and Macorna Bore (Figure 2). Also, the recent deep drilling success by the Canadian listed Mandalay Resources Ltd (TSX: MND) beneath its operating Costerfield gold-antimony mine is also very encouraging for Kalamazoo as it lies to the north east of the Castlemaine Goldfield (Figure 2). 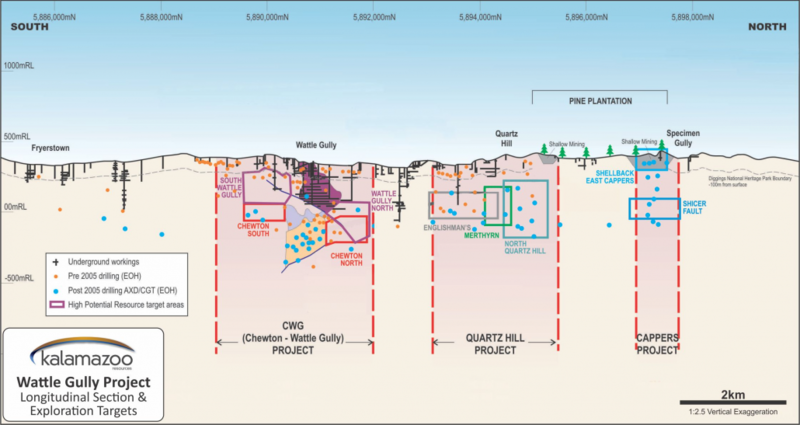 Centennial Mining Limited (ASX: CTL) is also operating its Porcupine Flat gold processing facility at Maldon, only 20km to the north west of Wattle Gully, which could also be a potential processing facility. 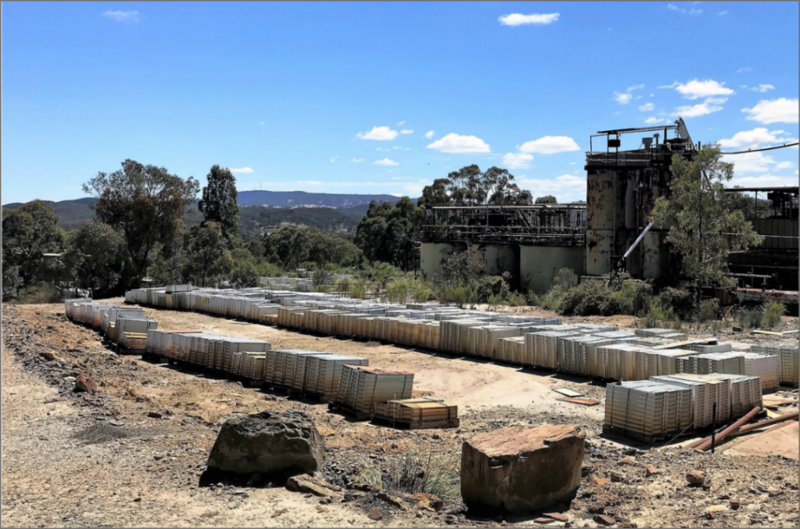 The current focus on the highly prospective Bendigo Zone has led to other leading ASX listed gold companies targeting potential new gold discoveries in the area. 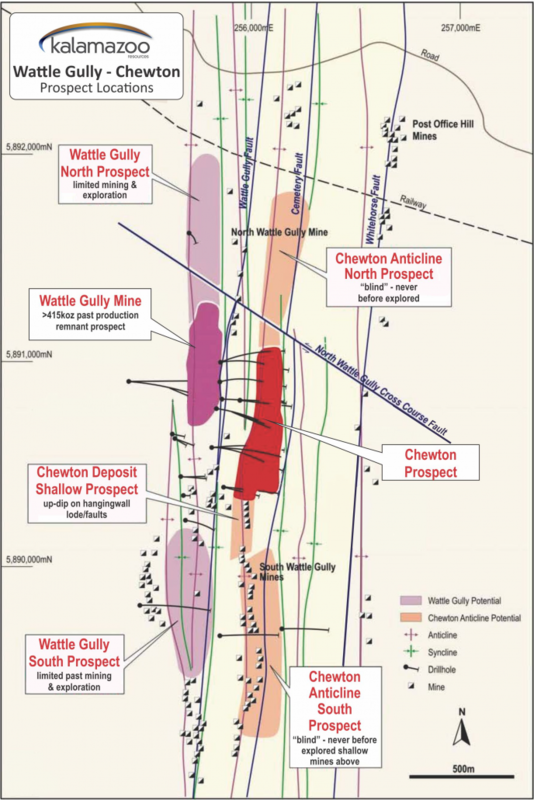 Recently Chalice Gold Mines (ASX: CHN), announced it had secured an extensive strategic position in the highly prospective northern Bendigo Zone via exploration licence applications covering a total area of 3,350km2 (refer to ASX: CHN 26 April 2018) with a focus on regional faults, interpreted to be the controls for significant gold mineralisation. Figure 4: Historical Gold Production Victorian Goldfields. The Castlemaine Goldfield is located approximately 100kms northwest of Melbourne and is well serviced with infrastructure, available work force and by a network of roads, railway and air services. The project area lies within easy distance of the major regional population centres of Ballarat and Bendigo. In comparison to the other fields within the Bendigo Zone, the Castlemaine Goldfield has not been tested comprehensively at depth leaving open the prospect of repetitions of mineralisation at deeper levels. The previous Castlemaine mining and exploration leases were controlled by Singapore-listed LionGold Corp Ltd (A78.SI) following its acquisition of then ASX-listed Castlemaine Goldfields Limited (ASX: CGT) in 2012. As part of this transaction, LionGold also acquired CGT’s operating Ballarat Gold Mine and since this time has largely focused its exploration efforts on near-mine targets around Ballarat. This granted exploration licence (EL006679) is valid for an initial period of five years with a minimum expenditure commitment of $265,000 over five years. Subsequently, Kalamazoo has applied for a second, larger tenement, EL006752, located east and south of the previously granted Castlemaine tenement. The tenement application EL006752, covers areas which have the potential for extensions of important structures (fault lines) known to be potential hosts for gold mineralisation. Kalamazoo has also been able to secure from CGT the project’s 200GB+ database, including 3D models of various deposits and the entire drill core farm (Figure 6). The replacement value of this dataset is estimated by Kalamazoo to be well in excess of $20 million. Only limited exploration has been conducted within the Castlemaine Goldfield since it was acquired by LionGold Corp in 2012. 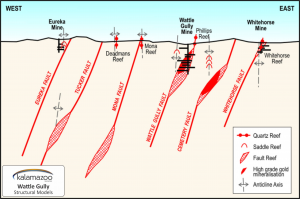 Certain modern exploration techniques, for example gravity and seismic surveying, have not been utilised within the project area but have proven to be very effective at Kirkland Lake’s Fosterville Gold Mine. 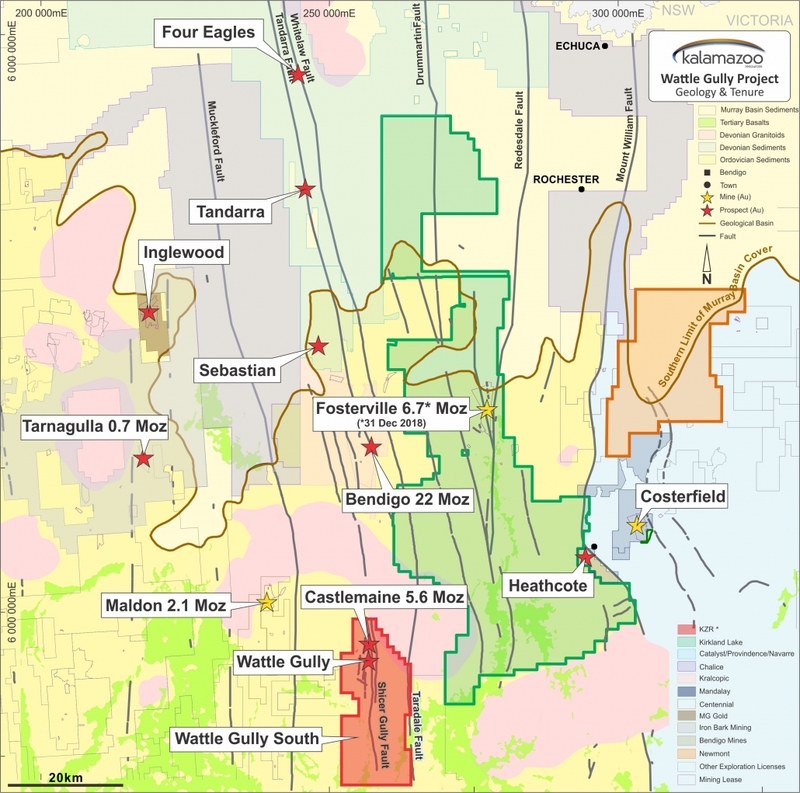 The Castlemaine Goldfield is located within a north trending mineralised zone approximately 10km long and 4km wide within the highly mineralised Bendigo-Ballarat Zone of the western Lachlan Fold Belt. The Bendigo-Ballarat Zone is bounded east and west by the regional north trending Mount William and Avoca Faults respectively. In turn, the north trending Taradale and Muckleford Faults bound the Castlemaine Goldfield and the licences east and west, respectively. Folded and faulted Lower Ordovician Castlemaine Group turbiditic sediments, predominantly underlie the licence area. These were deformed into regionally upright, tight, chevron-style folds. A strong axial plane cleavage has developed and folds are truncated by numerous reverse faults. The important Schicer Gully and Harris Faults divide the Castlemaine Goldfield into two structural domains with the western domain (west of the Schicer Gully Fault) containing most of the major mineralised structures. 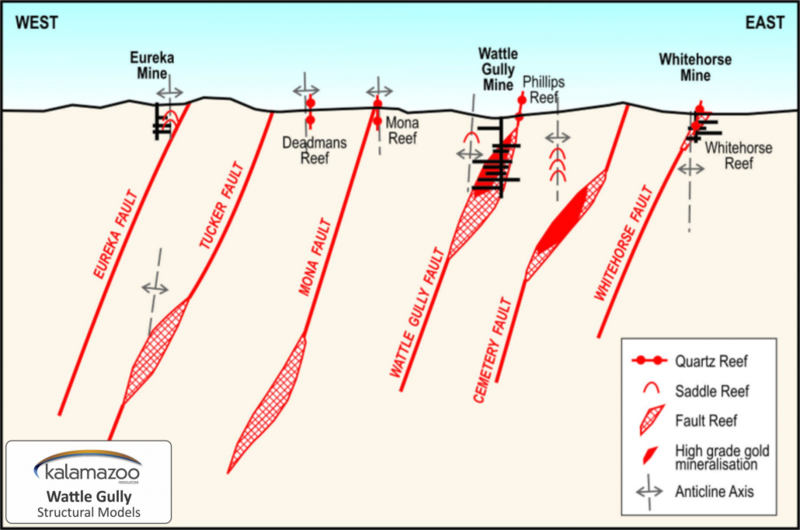 Mineralisation is predominantly associated with north striking quartz reefs and west dipping reverse faults with adjoining spur zones (Figure 8). 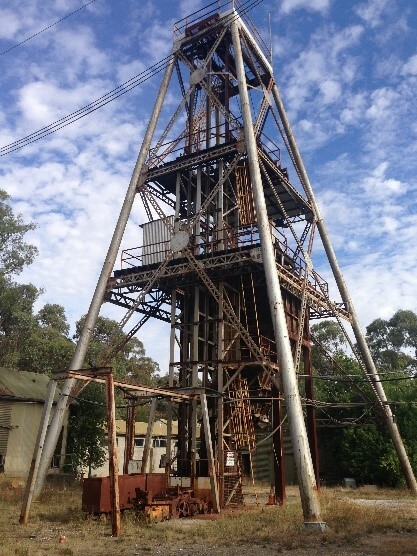 The Castlemaine Gold Project is located approximately 5km south east of the town of Castlemaine and the Wattle Gully mine (Figure 9) operated between 1934 and 1969. Gold mineralisation occurs as free grains in massive or laminated quartz reefs on west dipping faults, or as bedding discordant spur quartz veins. Mineralised quartz exhibits stylolitic ‘laminated’ textures with pyrite, arsenopyrite, base metal sulphides and numerous instances of visible gold. An initial review by Kalamazoo of the Castlemaine Goldfields confirmed that the Wattle Gully, North Quartz Hill, Eureka Vineyard and Cappers/Shellback projects were important sources for gold production (Figure 10). Kalamazoo intends to initially focus on these areas for their potential to develop exploration targets, most likely at depth, via a dedicated techncial review process which is well under way. The success of Kirkland Lake’s Fosterville Gold Mine with known gold mineralisation to 1,350m depth (refer to Scotiabank Mining Conference, December 6, 2016, Kirkland Lake Gold), the modern virgin discoveries of Tandarra and Four Eagles along the Whitelaw Fault corridor (Figure 2) and the nearby development of Mandalay’s Costerfield gold-antimony mine, indicate that successful exploration and development of profitable gold mines is possible in Victoria. Kalamazoo believes the combination of new exploration techniques and the knowledge that will be derived from the analysis of the extensive database and core farm will permit the company to outline an effective exploration strategy to identify areas with high grade gold potential. Kalamazoo considers community engagement important to all its activities and intends to develop relationships with all community stakeholders, including government agencies, local communities, interest groups and employees. Kalamazoo is vitally aware of its environmental responsibilities regarding the local communities and the preservation of the natural biodiversity in all areas and states within which it operates. Consultation with local councils and stakeholders will be an early and ongoing priority. What impact will KZR’s exploration activities have on the town? KZR’s strategy is to ensure minimal disturbance to the local Community and avoidance of sensitive heritage sites. Given that the majority of KZRs exploration area is located on either Crown Land, Castlemaine Diggings National Park or pine plantations we anticipate little to no direct impact on individual landowners. If KZR’s exploration activities show promise the town could expect some positive economic benefits such as a potential boost in local employment, business opportunities etc. Will you disturb heritage areas/sites? No – KZR’s strategy is to ensure minimal disturbance to the local Community and avoidance of sensitive heritage sites. KZR accepts and respects the fact that the local Community places a high value on the local heritage sites and are sensitive to any proposed exploration that may disturb them. Will KZR rehabilitate its explorations sites? All exploration programs including those that involve any ground disturbance such as exploration drilling cannot commence until first approved by the Victorian Government. It is a Government statutory requirement that KZR complete appropriate rehabilitation of any disturbed sites such as drilling pads and access tracks. It is important to note that Rehabilitation Bonds are first lodged with the Government before any ground disturbing exploration works can commence. Failure to comply with the Victoria Government’s Mineral Resources Act may result in forfeiture of exploration licences and financial penalties. What job/business opportunities will there be for locals? KZR is committed to supporting the local Community and will endeavour to source local labour, contractors and supplies whenever possible. It is important to note that early stage exploration projects usually only require limited local labour and supplies in the initial stages, due to the small scale and short duration of focussed exploration activities. Will you be paying compensation to local landowners? In the unlikely event that a local landowner is directly impacted by our exploration activities KZR will pay fair and reasonable costs to compensate the landowner accordingly. What happens should KZR have a gold discovery? In the event of a commercial discovery it typically takes at least 3-5 years before mine production could begin. During this time numerous tasks need to be successfully completed before mining can even commence such as mine planning and design, economic modelling, environmental assessments and approvals, Government regulatory approvals, funding etc. In the event of a discovery will KZR develop a large open cut mine? No – KZR’s current strategy is to explore for commercial deposits of gold that can be mined at depth through underground mining methods. It is important to note that no mining is allowed in the top 100m depth for a large proportion of the exploration area which is covered by the Castlemaine Diggings National Park. 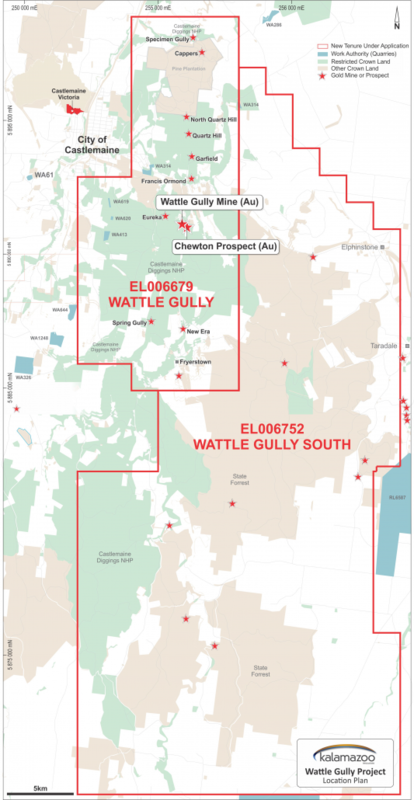 Will KZR be re-starting the Wattle Gully mine? We currently do not have any plans to restart the Wattle Gully Mine, rather we see greater exploration potential in the surrounding region. Consolidation and reconciliation of the substantial Castlemaine Goldfield database is in progress. Complete a technical review assisted by local consultants with a view to establishing exploration target(s). Review modern exploration practices and techniques suitable for this style of mineralisation which may include; soil sampling, mapping, ground and airborne magnetic surveying, seismic and gravity surveying. The overall aim is to identify and prioritise areas which will then be the focus of an exploration program to indicate gold potential and to establish a substantial gold mineral resource inventory by extensive drilling. The information in this release that relates to the exploration results of the Company is based on information compiled by Mr Lance Govey, a competent person who is a Member of The Australasian Institute of Mining and Metallurgy. Mr Govey is an employee of BinEx Consulting who is engaged as the Exploration Manager for the Company. Mr Govey has sufficient experience which is relevant to the style of mineralisation and type of deposit under consideration and to the activity which he is undertaking to qualify as a Competent Person as defined in the 2012 Edition of the ‘Australasian Code for Reporting of Exploration results, Mineral Resources and Ore Reserves’. Mr Govey consents to the inclusion in this document of the matters based on his information in the form and context in which it appears. Mr John Collier is the Principal Consultant to Conarco Consulting who is engaged as a Consultant to the Company. Mr Collier has sufficient experience which is relevant to the style of mineralisation and type of deposit under consideration and to the activity which he is undertaking to qualify as a Competent Person as defined in the 2012 Edition of the ‘Australasian Code for Reporting of Exploration results, Mineral Resources and Ore Reserves’. Mr Collier consents to the inclusion in this document of the matters based on his information in the form and context in which it appears.